This is YOUR journey but I’m here to support you all the way. The whole Smash the Pumpkin Project takes 10 months to complete – previous clients all prefer the slow and steady approach. The full course will cost £300 but there are different payment options and discounts which will help you to budget and which will make it more affordable. During the time that you are with the project you will receive a fortnightly email with some additional bonus emails thrown in (there are extra emails during the first weeks). Each email will contain details of an activity or challenge that you should work through. These have been designed to be done at the weekend or in the evening so that they can easily be worked into your current lifestyle. Some of these activities will cost you extra money which is not included in the course fee. This is because as you work through the project you will make choices and engage with the challenges in a very different way to anybody else; but my previous clients tell me that the cost of £1 a day (less if you use the discount) is a small price to pay for totally turning your life around. It is after all a lot less than the price of a coffee or a takeaway sandwich at lunchtime! There are several ways to get onboard with the Smash the Pumpkin Project. The different sign-up options are listed below, together with the action that you need to take for your chosen route. Not sure if the Smash the Pumpkin Project is for you? Sign up to a one month trial – and there is nothing to pay if you don’t want to continue with the course. Action: Send an email to info@scarletjonestravels.com with the words ‘1 month trial’ in the title. What price do you put on finding the confidence to live the life of your dreams? Enrol on the entire 10 month programme and receive a generous 20% discount. The full price of the course is £300. With the discount deducted you will pay £240 – that’s less than £1 a day! Action: Click on this payment button now and take advantage of this discount and pay £240. Pay £100 now and then make a further 2 payments of £100 each – one after 3 months and the other after 6 months. (you can opt out at the end of the first two stages if you wish although I am confident that you will see the project through to the end). If you are taking the special offer that includes the 10 one-to-one coaching sessions, this is the link that you need. This will get you thinking about your life and it might be all the encouragement that you need right now. What will you get when you commit to the Smash the Pumpkin Project? When you sign up to the Smash the Pumpkin Project you’ll receive an email every two weeks (or sometimes more) which will contain details of an activity or a challenge for you. Don’t worry – I’m not going to suggest that you throw yourself out of an aeroplane (unless you have a burning desire to try it) but you will need to push yourself a little bit. The challenges are all loosely themed around the medium of travel – after all, it was travelling solo that boosted my self confidence. 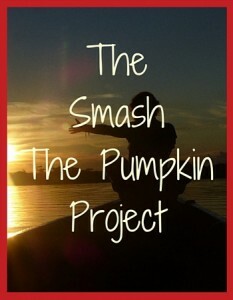 But the beauty of the Smash the Pumpkin Project is that you don’t need to quit your job or buy a backpack. The challenges are initially designed to be done from the comfort of your hometown on an evening or at a weekend. Your boundaries will gradually expand and you will travel further afield, both physically and mentally. When you subscribe to the Smash the Pumpkin Project I will show you how, over the weeks and the months, you can make small changes to your life. You will identify what excites you and you’ll challenge yourself to step outside of your comfort zone. Why do I need to wait up to 48 hours after payment for confirmation? I hope to process applications immediately but due to the nomadic nature of my life I occasionally end up in wifi-less towns and villages. The 48 hour leeway enables me to better manage your expectations although I always do my best to respond within 12 hours. Is there really no catch with the 1 month trial? Nope! I am confident that you will find value and benefit from the course but if it is genuinely not the right approach for you I don’t want to take your money. After the 4 weeks are up I will send you an email and you can choose whether to sign up and to continue or not. Will I have to pay anything else during the 10 month programme? Some of the activities will cost you extra money which is not included in the course fee. This is because as you work through the project you will make choices and engage with the challenges in a very different way to anybody else. However there are plenty of ideas and ways to save money with all of the challenges. As often as possible I will give you information about how to find cheap or free solutions to the challenges. You are nomadic. How can you manage your time for this project? Due to the nature of the Smash the Pumpkin Project and to ensure that I can give you total value for money I only accept a limited number of clients a month. This way you are guaranteed to get my full attention. I would rather accept less clients but deliver a top class mentoring programme. What is the relevance of the pumpkin? No worries. I want to make sure that the Smash the Pumpkin Project is a good fit for you too so I am very happy to connect with you. Let’s arrange to speak on a call (WhatsApp or Skype) so that I can tell you in person why I do what I do and how the project is working for my existing clients who are building their self-esteem and putting the sparkle back into their lives. Drop me an email at info@scarletjonestravels.com. Don’t put off booking that call. What do you have to lose, except maybe an hour of your time! As you work through the Smash the Pumpkin Project you will learn a little about my story and you will discover how I rebuilt my self confidence whilst growing your own self esteem. Unpeel the layers to expose the person that you really want to be.